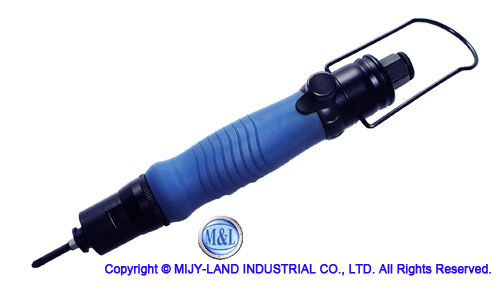 R Series-PBU (Button Type Push to Start Shut off), R Series-PBU (Button Type Push to Start Shut off) products, Mijy-Land Industrial Co., Ltd.
1. Button switches the direction by single hand either for Right-hander and Left-hander. 2. Push reverse button make instantly change direction of air motor rotation. 3. Push-to-Start system eliminates troublesome to press throttle lever. 4. Air motor will automatically stop when the load reaches at the pre-set torque. 5. High technologic patent DPM motor with more 30% power then general type. 6. Patent MSC clutch system-The one pulse has the merits of low vibration(less than 2.5ms) and low torque deviation (±3%). 7. Outside- Adjust the torque rapidly: Turn right to increase and left to decrease. 8. Comfort: Soft resin ergonomic grip design. Best balance and easy to grip. 9. The color ring-for torque manages and identifies???? ...Using site management. Founded in 1976, the main products M&L supplies are Pistol and straight type, shut-off, cushion, direct, and positive Air Screwdriver, drill and wrench. We have the advanced and excellent production equipments and technologies in producing, as our hot products, Air Screwdriver, Air Drill, Electric Screwdriver, Pneumatic Screwdriver, and Air Die Grinder. M&L provides patented clutch with 3% deviation of torque and longer life cycle of motor. Our color torque system gives users an easily visible torque marking system at a glance for all R-series tools to make the users choosing the color for each torque level on assembly line. As one of the professional and well-known Hand Tools supplier, M&L owns a completed production line as assembly, packing, sales, repair with our excellent R&D Department. We only provide our clients the best and quality products and services. Contact Us Now! We are ready to fill all of your volume orders! To find more products detailed information, please click here to our showroom or Contact Us Now for further products information. Our know-how will answer to all your needs!